For every architectural wonder and stroll along the Seine, there's something delicious to eat in Paris—and plenty of ways to do so. Cooking classes, walking tours, tastings, and dinner experiences ensure you won’t go hungry. Here are your options. Start the day with a simple breakfast of baked goods from a local boulangerie, where you can grab a croissant, which should be flaky and buttery; pain au chocolate, similar to a croissant but with chocolate in the middle; or a baguette, a thin loaf of crusty bread. Pop into a patisserie for an afternoon pick-me-up of colorful macarons, a delicate sandwich cookie made from meringue, and end your day with a French classic like bœuf bourguignon (a beef stew prepared in red wine) or coq a vin (braised chicken with mushrooms and onions)—two dishes made famous outside France in Julia Child’s cookbook Mastering the Art of French Cooking. Go behind the scenes of a boulangerie to learn the art of making baguettes and croissants. Dine at a restaurant by Alain Ducasse, a Michelin-star chef, restaurateur, and culinary national treasure. Take a walking tour to find Parisian delights, from chocolate to cheese to charcuterie. Discover the secrets behind French sweets such as macarons and crème brûlée with a pastry and dessert cooking class. Discover some of France’s finest wines during an intimate grand cru tasting experience in the heart of Paris. An expert sommelier will lead you through a tasting of six exceptional wines, including several quality-designated grand crus and premier crus, plus several older vintage wines. Swirl and sip in an atmospheric tasting cellar while expanding your knowledge of French winegrowing regions. Savor a selection of artisan cheeses and charcuterie alongside the exquisite pours. 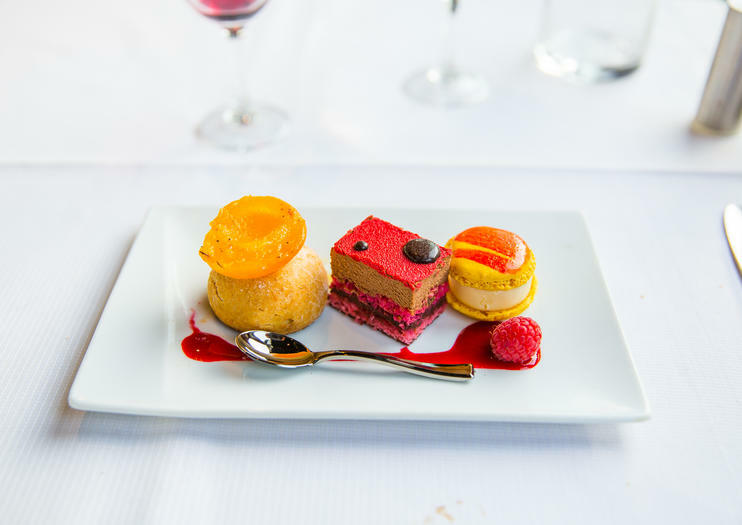 Enjoy a taste of authentic Lyonnaise cuisine without leaving Paris with a 3-course lunch or 4-course dinner at ‘Aux Lyonnais’ restaurant, owned by legendary French chef Alain Ducasse. Experience the atmosphere of a traditional Lyon ‘bouchon’ (bistro) as you tuck into regional delicacies with a contemporary twist, accompanied by fine wine. Sample the freshest French fish and seafood in the heart of Paris with a 3-course lunch or 4-course dinner the ‘Rech Seafood’ Restaurant, owned by legendary French chef Alain Ducasse. Depending on the season, tuck into dishes such as fresh oysters, Breton Lobster, sea bream, or mullet, prepared by top chef Damien Leroux and accompanied by fine French wines.